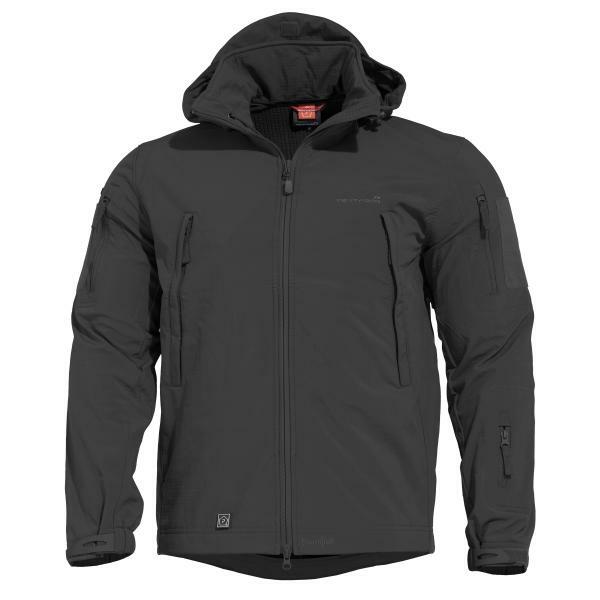 Isolatiekleding - Pentagon Artaxes Jacket Black - Noorloos Specialist Equipment B.V.
Artaxes Soft-shell Jacket, a companion to have with you at all times Laminated with Storm|Tex™ Water-proof membrane that offers WP 5000g/m²/24h and MPV 5000m²/24h keeping moisture and wind out. Flexible fabric offers comfort and lined on the inside with Grid|Tech™ waffel fleece keeps you warm and vetilated during activities. Hidden hood in colar is easy accesable and 3 point adjustable, Large chest pockets with inner compartments for your daily utilities, available earphone cable exit port on right chest pocket . Arm pockets with Hook n Loop patches 7cmx13cm for your insigina. Under arm ventilation with insect blocking mesh 2 inner chest pockets for documents and Large dual entry back pocket for larger accessories. •Removable reflector patch on hood.